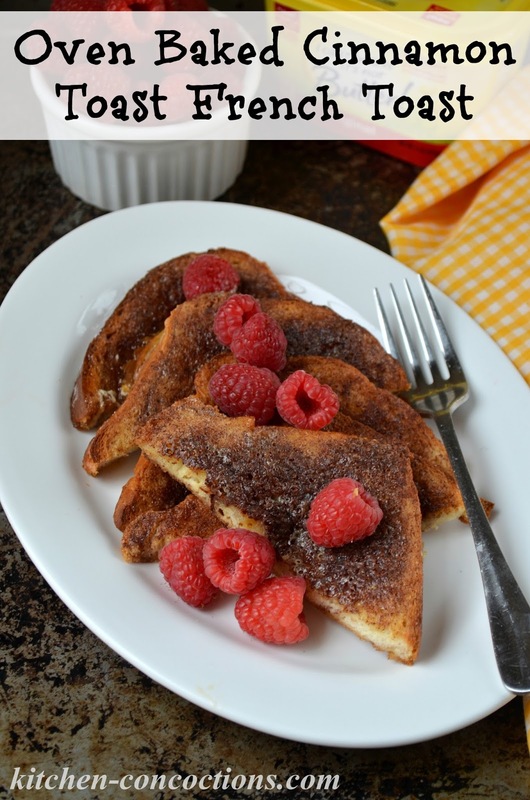 A childhood breakfast favorite… crispy, buttery, Cinnamon Toast; transformed into sophisticated French Toast! If you asked me as a child what my favorite meal of the day was, my immediate response, hands down, with no hesitation would be breakfast. Even though most mornings breakfast was just a bowl of cereal (I STILL puffy heart cereal!). But then on those special occasions, a lazy Saturday morning watching cartoons (can you BELIEVE they don’t have Saturday morning cartoons anymore!?!?! ), or right after a peaceful Sunday sunrise, or of course on a coveted holiday or sleep over with friends; my Mom would surprise us kids with a homemade hot breakfast. I use the word surprise loosely. Because if there was a Sunday morning or holiday without a family breakfast then there was something seriously wrong. Even though I have never been a morning person, the smell of sizzling bacon and warm, gooey cinnamon rolls would have any kid, tween or teen running, ok let’s be honest, stumbling into the kitchen! My Mom’s favorite breakfast treat to serve were cinnamon rolls. However, when she didn’t have any on hand or we lacked the time, then cinnamon toast was the next best option. And truthfully, I think I kind of like cinnamon toast better. That humble piece of white bread, or if we were lucky cinnamon raisin bread, slathered with butter, topped with that special cinnamon sugar blend, all toasted to crispy, crunchy perfection. Yes my friends, I would take that over a cinnamon roll any day! Now don’t think that you can just go slapping some cinnamon sugar on some toasted bread and call it cinnamon toast. No siree! There is an art to making perfect, beautiful cinnamon toast and my Mom had it down pack. 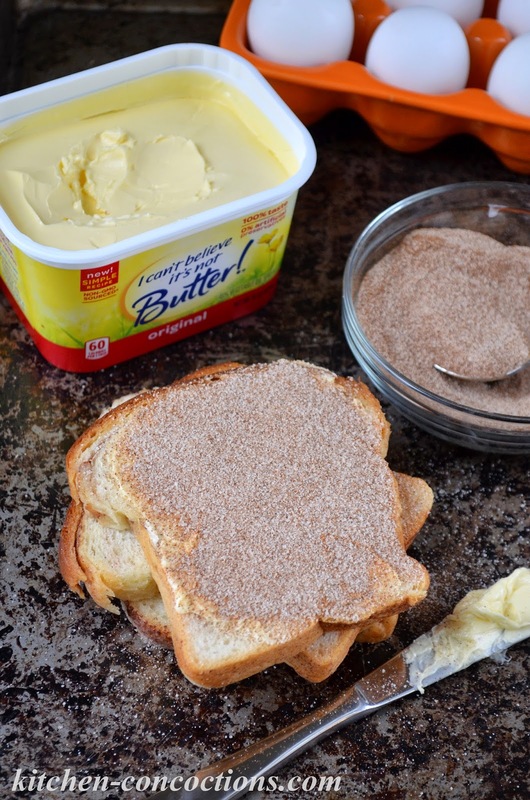 From the perfect cinnamon to sugar ratio, to the right bread, to using I Can’t Believe It’s Not Butter!®. Yes, my friends, due to the ability to easily spread (without ripping holes in the delicate bread) my Mom would smear I Can’t Believe It’s Not Butter!® on each and every piece of cinnamon toast I devoured during my childhood. Recently, when I wanted breakfast that reminded me of carefree Saturday mornings in front of the TV, I went to recreate this childhood favorite. When tracking down all the required ingredients, I was happy to learn that I Can’t Believe It’s Not Butter!® is now made from real, simple ingredients, like a blend of oils, water and salt. This means that not only is ICBINB still easy to spread, it has less saturated fat and calories than butter, but without skimping on that butter taste (you should try it for yourself and share what you think!) making it perfect for toast, baking and everything in between! After getting all the ingredients to make cinnamon toast just like Mom used to make, and devouring one piece, I decided to take things up a notch and transform my cinnamon toast into French toast. 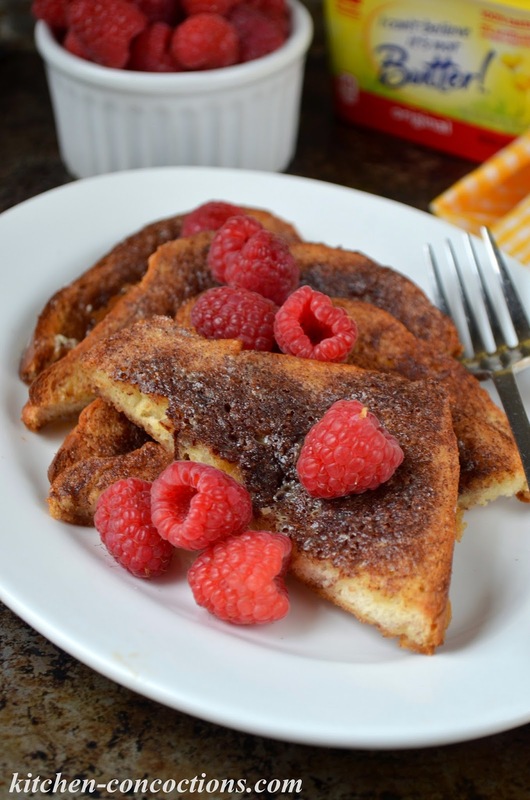 This version of French toast is such a delight! It has all those characteristics of cinnamon toast that I love, but can also be smothered in pure maple syrup. To keep things simple (read: dirty less dishes) I baked my French toast right on the pan I baked the cinnamon toast. Not only did this save dishes, it meant I didn’t have to stand and flip French toast all morning and everyone could have a hot piece of toast together. Oh, and in case you were wondering, some versions of baked French toast is super soggy and I am totally not a fan. But that is NOT the case with my method below…. 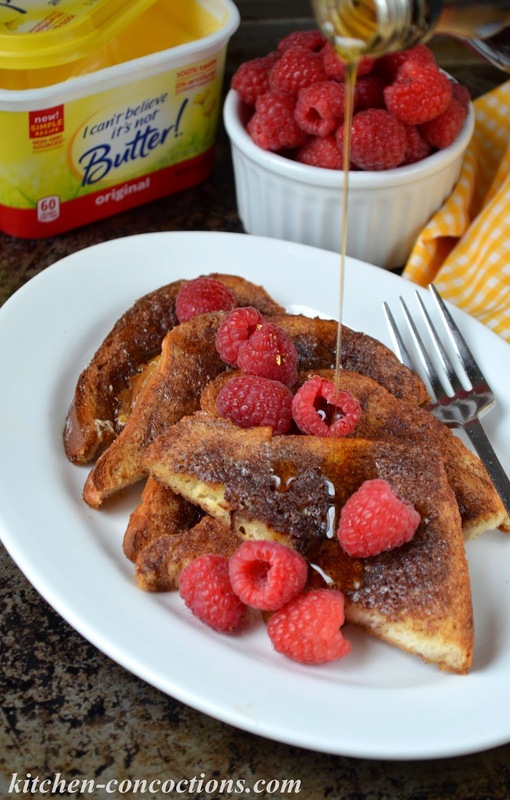 French toast perfection! 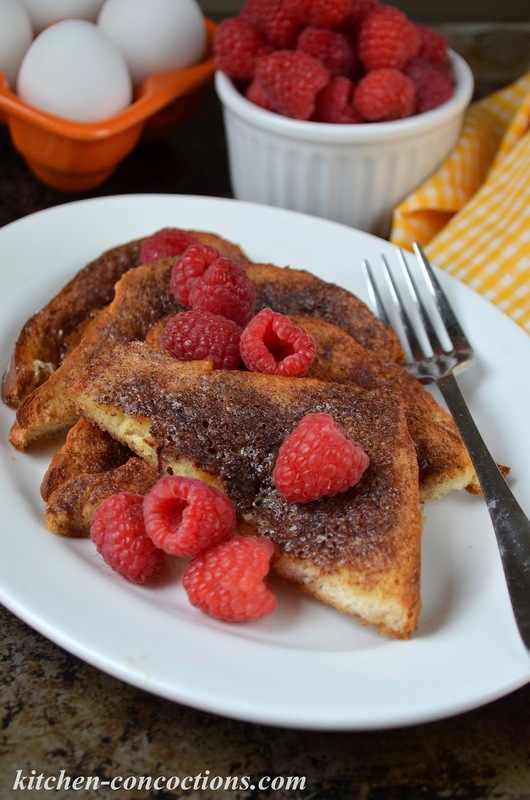 Crispy, buttery cinnamon toast; transformed into sophisticated French Toast! Preheat oven to 350 degrees F. Line baking sheet with foil and grease with 1-2 tablespoons I Can’t Believe It’s Not Butter! Set aside. In a small bowl stir together cinnamon and sugar. Set aside. Spread about 2 teaspoons I Can’t Believe It’s Not Butter! on one side of each slice of bread. Place buttered bread on baking sheet. 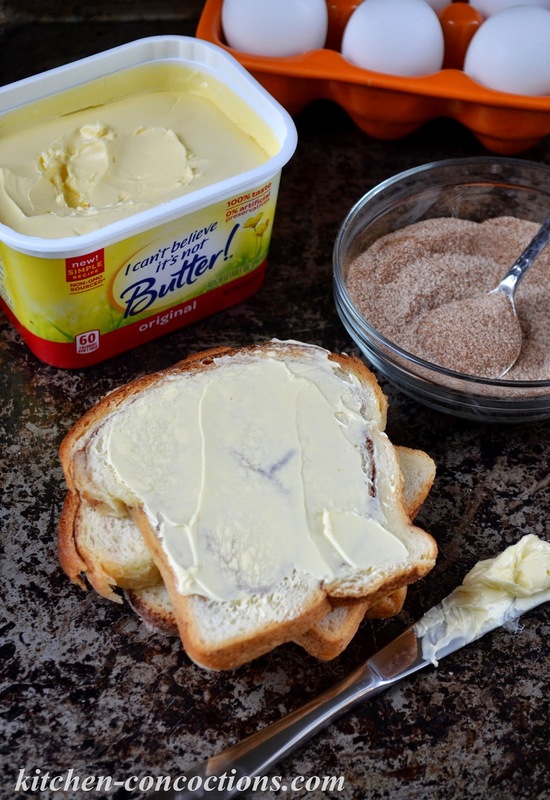 Sprinkle cinnamon/sugar mixture evenly on top of buttered bread. Bake bread in preheated oven for 8-10 minutes or until toasted. Remove cinnamon toast from oven and cool slightly. Meanwhile, in a large bowl whisk together eggs, half and half, vanilla and any renaming cinnamon/sugar mixture (about 1-2 tablespoons). Working in batches, add the cinnamon toast to the egg and cream mixture, turning to coat both sides. Using a fork, remove bread from egg mixture, letting any excess drip off. Return soaked toast back to the baking sheet. Repeat with remaining cinnamon toast. Bake soaked bread for 8-10 minutes or until golden brown. Serve immediately topped with fresh fruit, whipped cream, powdered sugar or maple syrup, if desired.